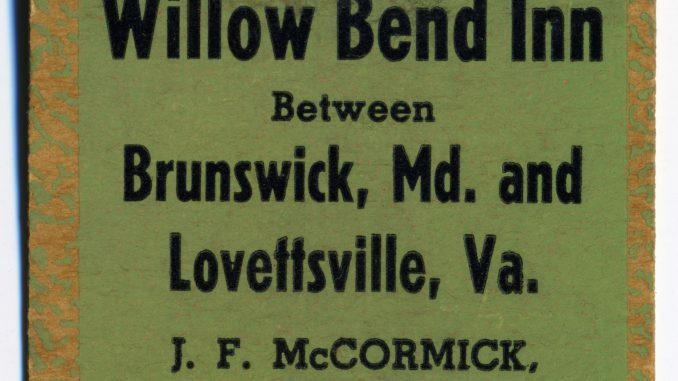 LOVETTSVILLE HISTORY-MYSTERY #1: Can you help the Lovettsville Museum by telling us anything you might know about the “Willow Bend Inn,” J.F. McCormick, proprietor? According to the cover on this matchbook purchased on eBay, the Willow Bend Inn was located somewhere between Lovettsville and Brunswick. Where, exactly? When was it in operation? Was it a restaurant or a motel, or perhaps both? Please share your memories in the Comments section below and help solve this history-mystery. To the best of my knowledge the Willow Bend Inn is the James house, the first house on the left as you turn on to Tollhouse Rd. The Willow tree behind the house on Filber’s creek, which can be seen by turning into the second driveway on the left on Tollhouse Road a few feet and looking to the left. That willow tree if it still exists, is also the namesake of my first publishing company, Willow Bend Books (now Heritage Books, Inc.). If the willow tree no longer exists let me know I have a picture of it somewhere. In the 1990s, I owned the property with the willow tree. Upon some Googling, I found multiple references to a Willow Bend book publishing entity of some kind in Lovettsville somewhere around the 1990s, but it seems to now be defunct. Unclear of connection, but feel there ought to be one.